Unfortunately there have been a delay! More below. Hello everyone! Thank you for your patience in awaiting 'A Tribute To Sonata Arctica' - we hope you have enjoyed the tracks released thus far! We regret to announce that the album will no longer be available on July 3rd 2015, and will instead be delayed by a couple of weeks. We are still waiting on solidifying a license in order to sell a couple of the tracks in specific areas of the world. This is due to the difference in laws around the world regarding cover tracks, as well as numerous publishers holding the rights to assorted albums in Sonata Arctica's back catalogue. 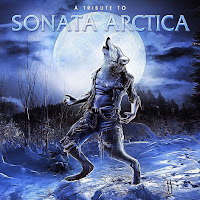 When we set out in order to release 'A Tribute To Sonata Arctica', we wished to deliver the album fairly to all Sonata Arctica fans around the world on the same date, as a mark of respect and fairness.Thus, we feel it is the best option to delay the album's release in order to keep this promise. We apologise to everyone who has ordered and is awaiting the album, and shall announce the rescheduled date as soon as possible.